2019 publications are available! Fill out the order form to receive a copy of your own in the mail, or download the digital version now from this webpage. 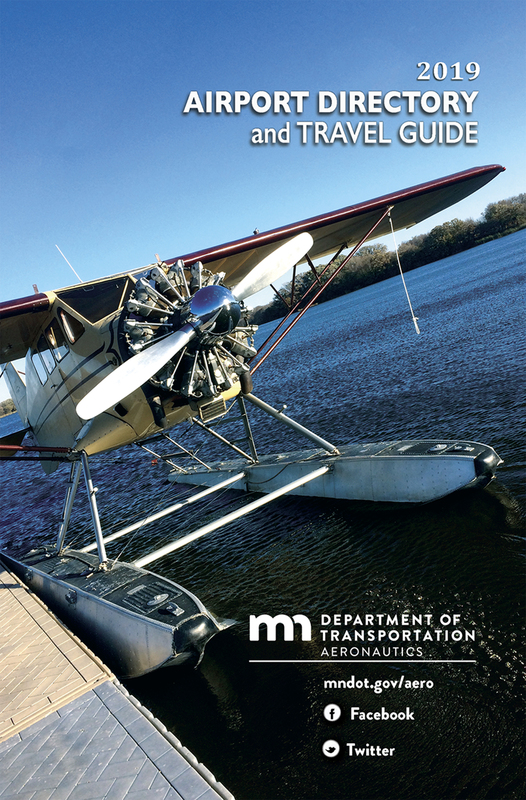 If you are a Minnesota aircraft owner who does not want to receive a paper copy of the MN Airport Directory and Travel Guide, opt out here. The Airport Directory PDF files can be viewed on your computer, iPad or other mobile device and includes links to help you find airports, area information and contact information for airport managers. To save it as a PDF on your computer or device click on the appropriate link and save the PDF or click "Open in iBooks" on your iPad. The 2019 Minnesota Airport Directory & Travel Guide will be available for mailing in late January. Download the 2019 PDF now, and watch our website and social media for details on when the 2019 publications will be available to order. Owners of aircraft registered with our office who have not opted-out of the mailing will receive one copy of the directory automatically around the beginning of February. Public-use seaplane base information can be found at the back of the Airport Directory and Travel Guide. Download FAA charts and publications, such as current Instrument Approach Procedure charts (IAP), Departure Procedure charts (DP), Standard Terminal Arrival charts (STAR), and Airport Diagrams. Also included are Take-Off, Radar, and Alternate Minima textual procedures. Only airports with instrument approaches are listed here. The most complete source for airport diagrams for Minnesota airports is still the Minnesota Airport Directory. Due to the presence of the spiney water flea, an emergency closure was implemented at Voyageurs National Park effective May 10, 2007. Seaplane operations are prohibited on all lakes within Voyageurs National Park until further notice except: Kabetogama Lake, Namakan Lake, Rainy Lake, Sand Point Lake. For more information contact Voyageurs National Park at 218-283-6600.